HubSpot's design manager combines all the tools that designers need to build state-of-the-art websites, while still giving marketers the flexibility that they desire when creating content. In this article, you will get a tour of all of the features of design manager. If you are looking for specific code examples and reference documentation, check out our Designers Documentation. Finder - a space to create and organize your files, templates, modules, and folders. Layout Editor - a drag and drop editor for structuring your page, blog, email, and system templates. Inspector - this is where you can edit the properties of a layout, module, or group. 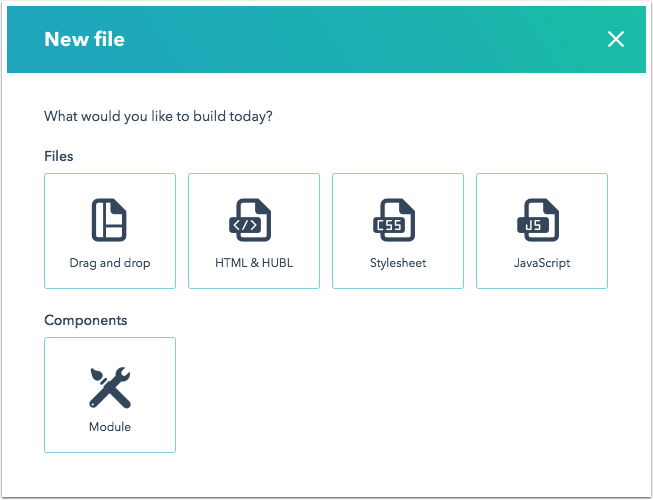 Module Editor - reusable custom modules that you can set up to add advanced functionality to your site that can still be managed by non-technical users. File Manager - a file hosting system for all of your site's assets. Navigate to your design manager to explore these tools. In your HubSpot account, navigate to Marketing > Files and Templates > Design Tools. The finder is a space to manage all your folders, templates, modules, and coded files. You can organize your files and folders however you like using the drag and drop interface of the finder. Clicking on a file can expand or collapse its contained files. Click File to create new files or folders, or to take action on the asset currently selected in the finder such as delete, clone, or rename the asset. Use the options under View to manage the arrangement of your files and folders. You can quickly collapse all folders or pull up recently edited or deleted assets. The finder is contextual, meaning that your actions will always be relative to folders and files selected. To create a new file or folder within a specific folder, click on that folder in the finder. You can click View > Deselect all if you'd like to create a new file or folder outside any of your existing folders. Clone - make a copy of your file, folder, or template. Move - select a new folder for your asset. Rename - give the asset a new name. Clone to HTML - create a copy of your asset entirely coded in HTML. 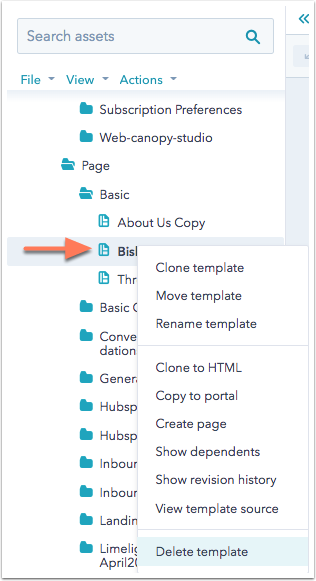 Copy to portal - create a copy of your asset and send it to another HubSpot account you have access to. Create page/email - create a new piece of content using this template. Show dependents - see a list of any HubSpot content using the using the file. Show revision history - review a history of saved versions. Copy snippet - use this to quickly copy the code snippet of your custom coded module onto your clipboard. This option will only appear when right clicking on a module. Delete - delete this file, folder, template, or module. When you click the name of a template, module, or coded file, it opens your selection in a tab in the editor. Tabs make it easy for you to multi-task and toggle between you various templates and coded files. You can right-click any tab to reveal options to manage your tabs in the editor. You can review a full list of open tabs by clicking the down arrow on the right. To give yourself more space to work in the layout editor, you can click the collapse icon first to collapse the finder. You can expand the finder again by clicking the folder icon folder. Drag and drop: a template built by adding modules to an intuitive drag and drop interface. Stylesheet: a coded CSS file that can be used to style modules and files. Module: a custom coded module that can be added to a template. The layout editor is a drag and drop interface for the structure and default content of your pages and emails. You'll see the names of your modules and groups, along with the body class applied to each component. You can modify each module or group by clicking it for editing in the inspector on the right side, or by right-clicking on the component to access the functionality of the inspector. Drag and drop components in the layout editor to adjust their placement and size on your template. There are Undo and Redo buttons in the upper-left corner to help you quickly revert your changes. 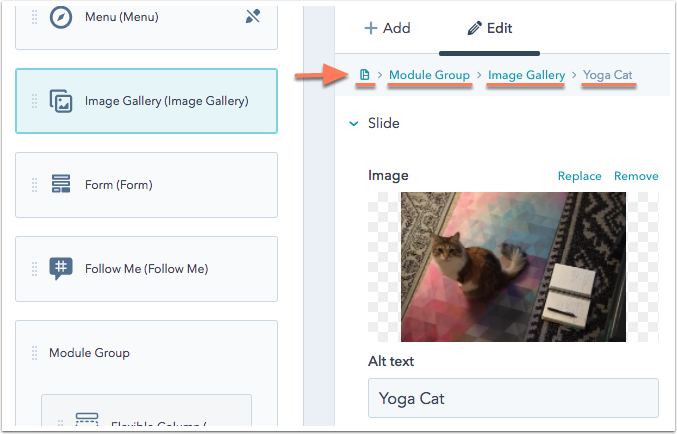 You can also right-click a module to quickly group, clone, or change a module type, or use keyboard shortcuts to achieve the same actions. Click the Preview button in the upper-right corner to preview your work and test your layout on different screen sizes. All HubSpot template layouts are responsive, meaning they automatically adjust to different screen sizes. 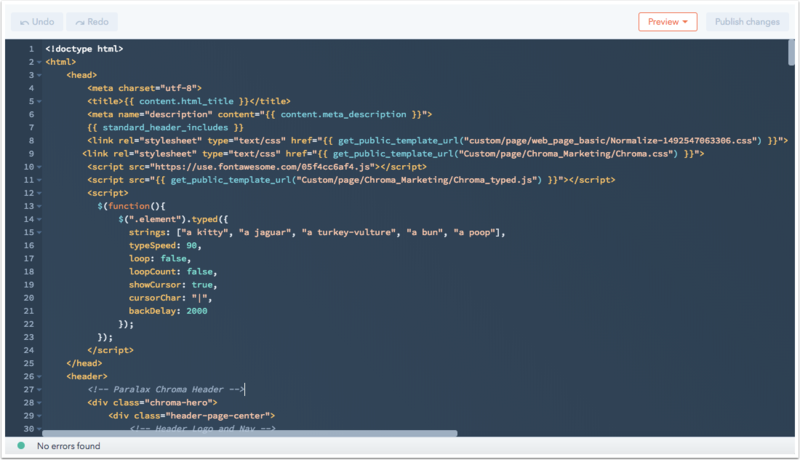 This editor compiles your drag and drop modules into clean HTML markup that's made responsive by some built-in CSS. You will learn about creating and editing templates, as well as adding styles to your template, in later sections of this guide. When a component is selected in the drag & drop editor, the inspector will show all of the features and options of that component. When no component is selected in the drag & drop editor, the inspector will show options for the template itself. When editing a module, the inspector allows you to edit and add fields. Depending on the type of module selected on your template, there may be different options available in the inspector. For drag and drop templates, the + Add tab is used to add new components to your layout. The Edit tab of the inspector can be used to assign custom CSS classes, edit default content, or attach coded files. The inspector includes a breadcrumb navigation at the top to help you quickly navigate between the asset, module, group, and template you're currently working on. 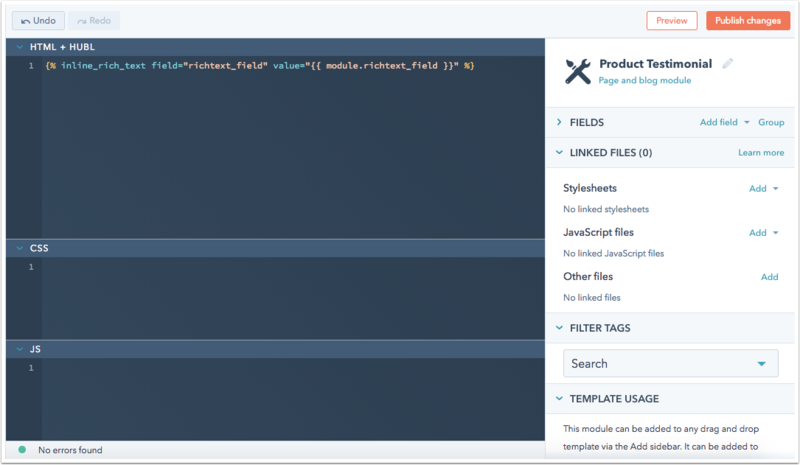 For custom coded HTML & HUBL templates and modules, you can use the inspector to add new fields or link to coded files. You can also add filter tags to indicate the content type and function of your coded templates and modules to make them more easily searchable in the finder. You can also find snippets and more details about how these custom coded assets can be used in your templates. You will learn more about how to use the code editor in a later section of this guide. Use the inspector to add fields, attach coded files, or add tags to organize your assets. Just like in the code editor, you can live preview your work on a variety of screen sizes as you go. You can also specify default content for your module fields, lock default content, or make specific module fields required. 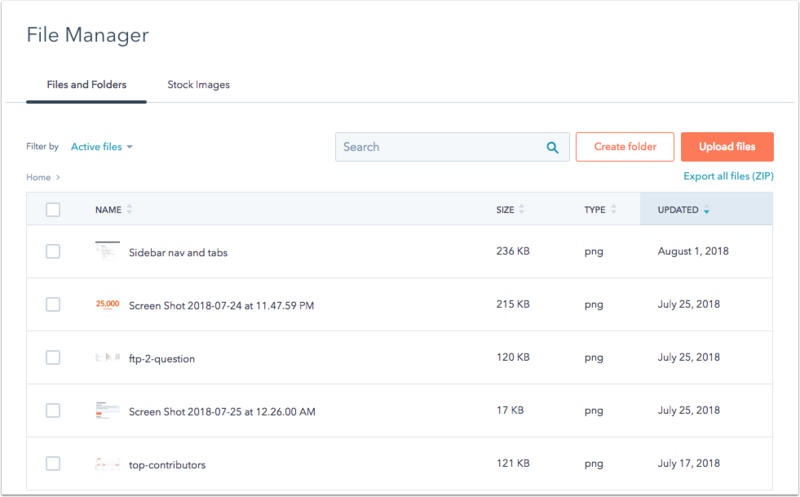 HubSpot's file manager stores all the assets that you use to create content. This tool allows you to upload PDFs, images, videos, audio files, fonts, and more. You can access your creative assets or quickly upload new files without having to leave the app.